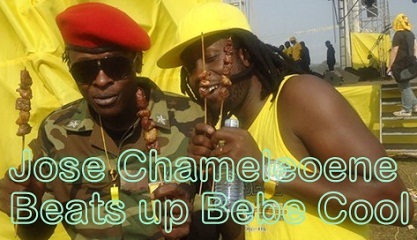 Something should be terribly wrong with Jose Chameleone and he will stop at nothing to make news. He has been in the news for having converted to Islam only to make a U turn 36 hours later. The Catholic Church has insisted the star should undergo training for close to two years before he can be accepted back to the church. Before the dust could settle over the Islam saga, Chameleone went to Club Rouge and straight on started beating Bebe Cool. Bebe Cool in his words said; "I cannot believe JOSE CHAMELEON entered rouge & started fighting me his maker after all I have done for this chap now I accept a lost chap is a lost chap, I will never protect CHAMELEON again am not surprised he's fighting me coz he needs the front page more than anybody. ma advise to u Chameleon sing music coz i've got a lot in stock watch yo skin." Other sources seem to have it that this fight stems from Bobi Wine's wedding. Bebe Cool's camp was trying to pursuade Chameleone's Leone Island Crew not to attend Bobi Wine's forthcoming wedding and that is how one thing led to the other. Jose who will be launching his Omukisa Gwo at Hotel Africana this Saturday posted this on his wall; "You are not even ashamed to declare me an enemy because Iam going for Bobi's Wedding? BEBE STYLE UP. We are not as young as yesterday. Shame on your Mouth and jealousy deeds." Bebe Cool will be performing in the UK on Saturday at Troxy, 490 Commercial road during the Ugandan Convention UK. He will perform with Eddie Kenzo, Bella, Mesach Semakula and his wife Zuena.